Katie Holmes hits the red carpet at the premiere of her new movie Days and Nights on Thursday evening (September 25) at the IFC Center in New York City. The indie film was written and directed by theater actor Christian Camargo, who also stars alongside Katie, Juliet Rylance, and Cherry Jones. Other celebs in attendance at the event that night included The Knick‘s Eve Hewson, Sting, Mickey Sumner, and Broadway star Condola Rashad. The movie is inspired by Anton Chekhov‘s classic story “The Seagull.” It follows the reckless desire that wreaks havoc over Memorial Day weekend as a family confronts the volatile and fragile nature of love. Check it out in limited theaters this weekend! FYI: Katie is wearing a Holmes and Yang blazer, Acne jeans, and Michael Kors shoes. New 'Breaking Dawn' Character Posters! 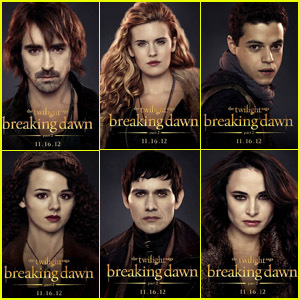 Lee Pace, Maggie Grace, Christian Camargo, Mia Maestro, Rami Malek, and Omar Metwally all channel their vampire characters in newly released character posters for The Twilight Saga: Breaking Dawn Part 2! Casey LaBow, MyAnna Buring, Tracey Heggins, Judith Shekoni, Noel Fisher, Guri Weinberg, Angela Sarafyan, Andrea Gabriel, Patrick Brennan, Marlane Barnes, and Lisa Howard are also featured in new posters! Earlier this week, Kristen Stewart, Robert Pattinson, and Taylor Lautner participated in a panel at 2012 Comic-Con, where they chatted about the upcoming movie.